With the objective to keep an ordered process, the .MX re-opening will be released in three phases: Pre-Registration Period, Quiet Period and Initial Registration Period. Description: Period for the reception of applications to register domain names directly under .MX, only from current domain name holders under any of the classifications .COM.MX, .NET.MX, .ORG.MX, .EDU.MX and .GOB.MX. Who can participate: Domain name holders (registrants) of valid .MX domain names under any of the classifications .COM.MX, .NET.MX, .ORG.MX, .EDU.MX and .GOB.MX registered before March 1st 2009. What can they do: Participants will be able to send an application to register directly under .MX the exact same name that they have under any of the other classifications. For example: if currently they are the domain name holder of organization.com.mx then they can apply to register organization.mx. The application must be sent through the same registrar who sponsors the current domain name (organization.com.mx). Considerations: The registrant and the sponsoring RAR of the new domain name under .MX will have to be the same that of the current domain name. If more than one application is received for the same domain name, priority will be given to the application corresponding to the domain name with greater seniority, that is, the domain name with the oldest creation date according to NIC Mexico's records. All applications not corresponding to the oldest domain name will remain in a "pending" status until they are processed at the end of the Pre-Registration period. 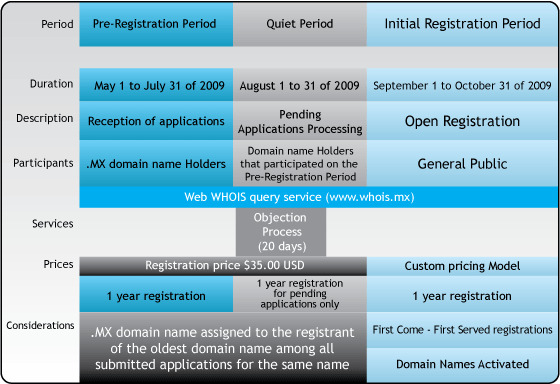 The registration data of all domain names that were assigned during the Pre-Registration period will be available for inquiring through the WHOIS query service (http://www.whois.mx). The registration period will be of 1 year only. Duration: 3 months (May 1st to July 31st 2009). Description: During this period, no more applications will be accepted; instead all the application received during Pre-Registration period that remained in a "pending" status will be processed. All the domain names assigned during Pre-Registration and present Quiet Period will become active (published on the DNS) at the end of this period. In addition, there will be available an "Objection process against the .MX domain names assignation result". Who can participate: Holders (registrants) of domain names under any classification who have sent an application for the registration of a domain name directly under .MX during the Pre-Registration period that was left in a "pending" status. What can they do: Participants will be able to inquire the assignation data of .MX domain names through the WHOIS query service. In case of considering that the assignation didn't follow the rules of the Pre-Registration period; participants would be able to start an "Objection process against the .MX domain names assignation result". The rules for the Objection Process will be published before the beginning of the .MX re-opening. Considerations: t is very important that interested parties watch the result of their applications very closely. WHOIS query service (http://www.whois.mx) will be available to verify the assignation information. Duration: 1 month (August 1st to 31st 2009). Description: During this period, the domain name registration directly under .MX will be open to all public. Domain names will be assigned in the same order that the applications are received by Registry .MX. Who can participate: General Public. Anyone interested in registering a domain name directly under .MX. What can they do: They will be able to register domain names directly under .MX. Considerations: If the domain name is available at the time when the application request is received, the domain will be immediately registered after completing the registration process. The registration period will be of 1 year only. Also an special pricing model will be used, which will be published in detail prior to the Initial Registration Period. Duration: 2 months (September 1st to October 31st 2009). As part of the rules of the .MX re-opening process, there is a reserved names policy that will include the names that cannot be registered under .MX, such as names consisting on 1 and 2 characters, among others.